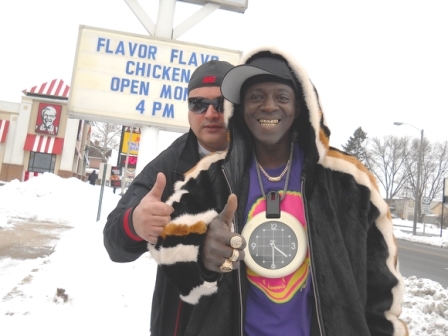 *The man who went into business with Flavor Flav is speaking out in after their fried chicken restaurant in Clinton, Iowa abruptly closed its doors on Sunday. As previously reported, Flav said he was pulling a license that allowed restaurant manager Nick Cimino to use his name in the restaurant because he “isn’t running the business right.” Some former employees had complained that their paychecks bounced, and the reality TV star said he exchanged harsh words with Cimino. Cimino has fired back, telling WQAD-TV that Flav was “a fraud” who was trying to get rich off of his ideas and work. Flav’s Fried Chicken in Clinton, Iowa, opened in January. I wonder if the chicken tasted good? Oh well, guess I have to settle for Roscoe’s chicken and waffles here on the coast!